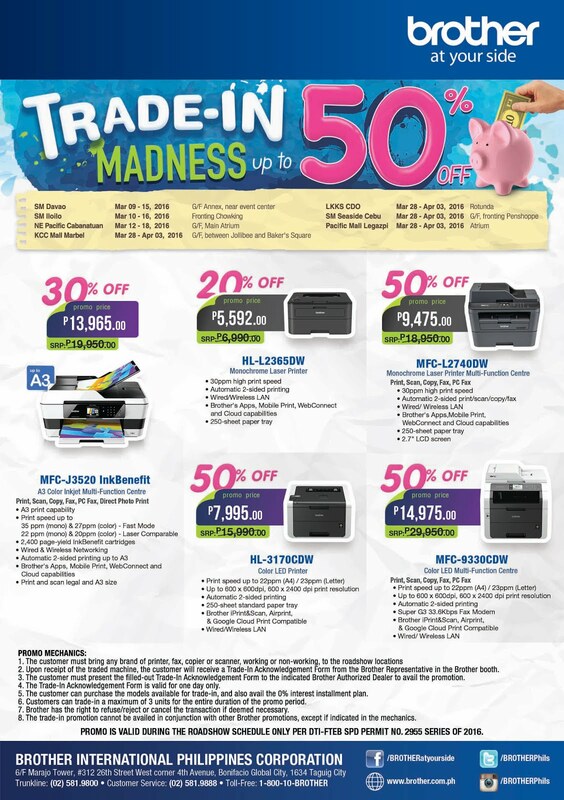 Get exclusive discounts with Brother Trade-In Madness Promo and get up to 50% off on a brand new Brother printers and multi-function printers. You can surrender your old printing, scanning machines, even copiers and fax of any brand! From March 4 to April 3, 2016, customers from all over the Philippines can upgrade their current printing, communication and digital imaging systems at more affordable prices with Brother’s Trade-In Madness Promo. Simply bringing in working or non-working printers, fax, copiers and scanners of any brand at select venues entitles a customer to up to 50 percent off on brand-new Brother printers and Multi-Function Centres. 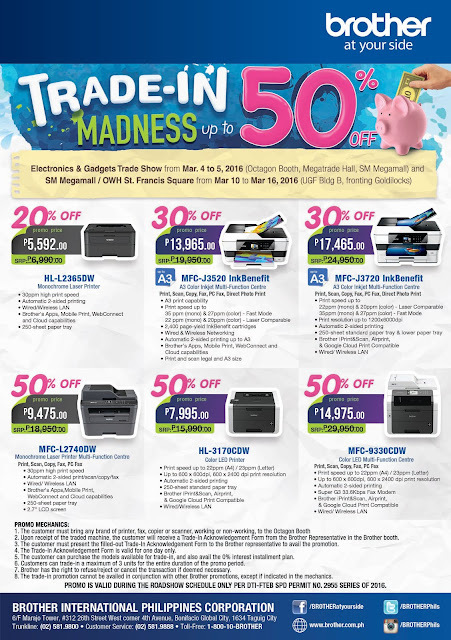 By trading in up to three of their old machines, customers can enjoy 50 percent off on the HL-3170CDW Color LED Printer (P7,995.00 from 15,990.00 SRP), MFC-L2740DW Monochrome Laser Multi-Function Centre (P9,475.00 from P18,950.00 SRP) and MFC-9330CDW Color LED Multifunction Centre (P14,975.00 from P29,950 SRP). These high-performing LED and laser printing powerhouses redefine office efficiency with Brother’s patented digital imaging technology. Printing is quick, precise and cost-efficient, and users can enjoy a host of convenient features that allow for optimal productivity at the workplace or at home. For the entire promo duration, customers can take 30 percent off on the MFC-J3520 InkBenefit (P13,965.00 from P19,950.00 SRP) and MFC-J3720 Ink Benefit (P17,465.00 from P24,950.00 SRP) A3 Color Inkjet Multifunction Centres. These multifunction machines allow users to enjoy high-quality direct photo printing with impressive ink efficiency, crisp black-and-white and color printing, scanning, copying, fax and PC fax. With Brother’s patented InkBenefit technology, users can print up to 2,400 pages on every cartridge batch. Customers in need of a reliable laser printer will love the Brother HL-L2365 Monochrome Laser Printer, now PHP5,592.00 from P6,990.00 SRP with the Trade-In Madness Promo. This model boasts of 30ppm(pages per minute) print speeds, automatic two-sided printing and a host of Brother apps for increased user convenience. For the complete promo details and mechanics, visit brother.com.ph or call (02) 581-9888.